Eleven Atlanta mayoral candidates discussed topics such as affordable housing, public transportation and education in a forum at Emory Sept. 28. The event was co-hosted by Emory, the League of Women Voters of Georgia and the League of Women Voters of Atlanta-Fulton County. Approximately 100 students and community members attended the event at Glenn Memorial Auditorium. 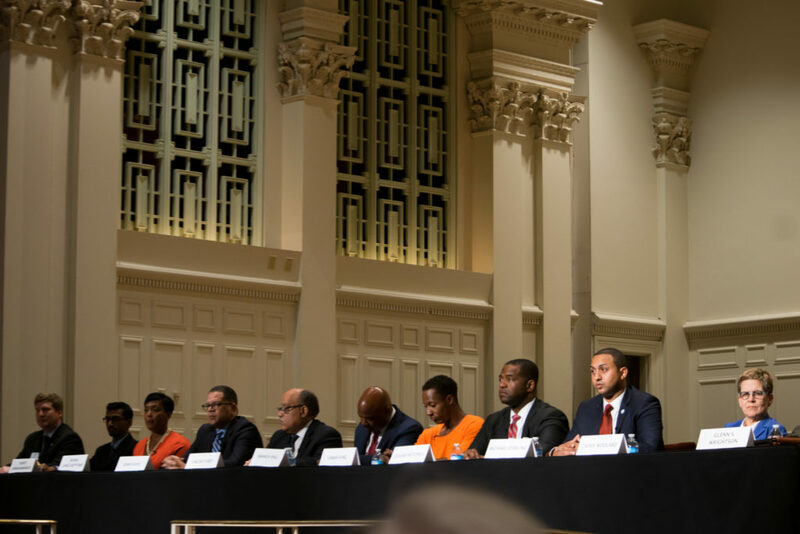 The candidates were asked six questions for two hours on Atlanta-centric topics ranging from infrastructure to education, and given one to two minutes to respond depending on the question. Director of Editorials and Public Affairs at WSB-TV Jocelyn Dorsey moderated the discussion. The forum was streamed live across WSB-TV’s social media channels. University President Claire E. Sterk opened the event with remarks regarding Emory’s relationship with the city of Atlanta. The University is currently in negotiations with the city regarding monetary details of its potential annexation. Two mayoral candidates, current frontrunner and Atlanta City Councilwoman Mary Norwood (74C) and teaching assistant at Georgia State University Carl A. Jackson, did not attend the forum. “I was unable to attend tonight’s LWGA debate because I had a previous commitment to hear the concerns of Atlanta’s neighborhood residents,” Norwood tweeted. Nine of 11 Atlanta nonpartisan mayoral candidates expressed support for Emory and the Centers for Disease Control and Prevention (CDC)’s move to annex into the city of Atlanta. Only Laban King and Georgia state Sen. and Minority Whip Vincent Fort publicly opposed the move. “Emory and the CDC need to stay right where they are,” King said. Fort characterized the maneuver as Emory “jumping in line” for funding for MARTA’s proposed Clifton Corridor Transit Initiative, which would connect the University to downtown Atlanta via light rail. “The people of the city of Atlanta didn’t vote to build from DeKalb … it’s Emory, [a] wealthy, elitist institution jumping in line,” Fort said. Fort accused an “agent of Emory” of playing a role in the closure of the Peachtree-Pine homeless shelter in Midtown Atlanta. The facility was sold in August to Central Atlanta Progress for $9.7 million as part of a settlement, according to the Atlanta Journal-Constitution (AJC). No information has been found to corroborate Fort’s statement, according to the AJC. Although the most recent polling only has Fort earning 6.1 percent of the vote, the candidate has been gaining national attention, picking up an endorsement from Sen. Bernie Sanders (I-Vt.), according to the AJC. Norwood holds the lead with 25.4 percent of the vote and Atlanta City Councilwoman Keisha Lance Bottoms, former city of Atlanta Chief Operating Officer (COO) Peter Aman and Atlanta City Council President Ceasar Mitchell trail behind at 12.4, 12.1 and 10.4 percent, respectively, according to the most recent polling data compiled by Landmark Communications in partnership with WSB-TV. Bottoms voiced her support of the annexation. Bottoms cited her experience on Atlanta City Council and as the only candidate who has spent time in “both” Atlantas, growing up in a low-income community and eventually ascending to a spot on City Council. Bottoms outlined her support for increasing walking and biking paths to alleviate traffic and the formation of an online contract bidding system for the city to increase transparency on contract negotiations process. She said that if elected mayor, she would establish a director of education to serve as a liaison between Atlanta Public Schools (APS) and city government and be proactive in combatting low childhood and adult literacy rates. Aman emphasized a need to hold city employees accountable for their spending and outlined his plan to transform the MARTA system in an effort to improve infrastructure and traffic conditions in the city. He called for more light and heavy rails, buses and centralized control over traffic lights. Mitchell also expressed his desire to acquire state funding for MARTA and connect the transit system with the Atlanta Beltline. As Council president, Mitchell posted a list of all his expenses online — a practice he said he would continue as mayor. He also said that he intends to start a series of after-school programs for APS students interested in learning skills and trades like coding, enabling them to work toward a degree while in high school. Mitchell pointed to his plans for improving housing equity and affordability, citing his past experiences as an attorney focused on real estate and finance. Other candidates in attendance included former Atlanta City Council President Cathy Woolard, Atlanta City Councilman Kwanza Hall, former Fulton County Commission Chairman John Eaves, former Atlanta Workforce Development Agency Director Michael T. Sterling and political outsiders Glenn S. Wrightson and Rohit Ammanamanchi. Voting for the Atlanta mayoral election will be held Nov. 7. Current Atlanta Mayor Kasim Reed has already served two terms and is ineligible for reelection. If no candidate receives an absolute majority of 50 percent of the vote, a runoff vote will be held between the top two finishers Dec. 5.